The Future's Rosie: She's still standing...yeah yeah yeah! She's still standing...yeah yeah yeah! 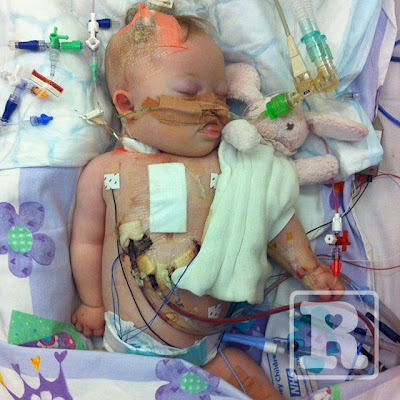 This coming Thursday see's the second anniversary of Rosie's life saving open heart surgery at Alder Hey Children's Hospital. It's always hard emotionally thinking back to that time. Equally it's vital that I don't allow the experience to become nothing more than a distant memory – such was the importance of the operation, without which we wouldn't be able to celebrate all her amazing achievements. Last year, on the first anniversary we received a lovely card from our friends Amy, Ian & Ella which simply said, 'Happy Heart Day' – I've always loved that and shall remember the day with this phrase each year. It's usually the case that Rosie will achieve something new, I'll excitedly write a post about it then she'll not do it again for months. 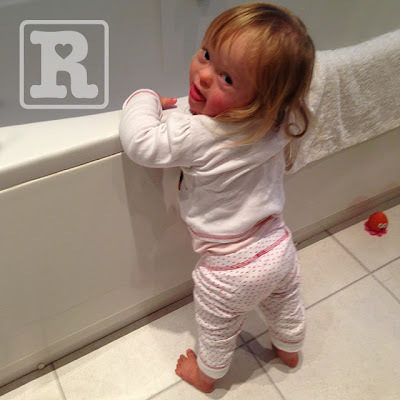 However, on this occasion I'm really pleased to say that since my last post, Rosie is still going strong learning to stand up and strengthen her legs. I'm very proud of her efforts which in turn are pushing my fears of her never walking further away each day. There is such a long way to go yet but here we are a couple of weeks on and the novelty is yet to wear off! ...to here in just under two years! Our little hero. Way to go sweet girl! Keep them in suspense and then surprise the heck out of everyone! Keep up the strong work! Love you guys! The first photo makes me feel so sad for this little sweetie pie but looking at the second photo makes me happy. Rosie is so adorable!!! The first photo is so harrowing, always worse when you look back I think as at the time you simply work on auto pilot somehow. But look at her go now! Game of kiss chase next time we meet I think. Ha ha that really made me laugh! Happy Heart Day to Rosie, you and your entire family. Thank you so much for your openness and honesty. My little girl had her heart surgery about 6 weeks ago. Tomorrow we go to London for her first post surgery check up. Seeing your pictures brings back a lot of emotion and memories of that incredibly difficult time. Waiting for her to come out of her surgery was the longest afternoon of our lives. Since then she has done so well, we're so proud of our little angel. Your posts always inspire us. Your family's journey seems to be so similar to ours but a couple of years ahead. Finding your blog has been a blessing, thanks again for all the help you've given my new little family. Thank you very much for your comment. It means a great deal to me to know it has helped. I always set out with the idea that if telling our story helps just one person it's achieved everything I wanted it to. Your comment means so much and adds to the fuel that inspires me to keep going. Wishing your little one the very best and good luck with the check-up. Rosie and you are an example of courage and also an inspiration to anyone living hard times at this very moment. Looking at her, makes everyone want to give any fight life asks us to! Laura Oreamuno. Costa Rica. She is so gorgeous. It must have been so tough to see her so vulnerable with all those tubes and things. So amazing to see the photo of her now looking so happy and cheeky! x Look forward to meeting you at the #MADs tomorrow evening :) We are in the same category so good luck with it all!